The week before Christmas and the whole of Fleetwood waited. A trawler was overdue… and a silence descended on the port. For days the sea around Skerryvore in the South Minch was scoured for the 449-ton Red Falcon and her crew of 19 in a massive sea and air search. Families waited with mounting anxiety – eyes scanning the horizon in vain and hope. But the Red Falcon was lost – presumed to have been overwhelmed in heavy seas as she made for home. Wreckage – including a rocket container box, pieces of wood believed to be floorboards on a lifeboat and two lifebuoys stamped – was washed up 25 miles north of the vessel’s last known position. Lost with all hands – leaving 25 children fatherless and a town too stunned to celebrate Christmas. 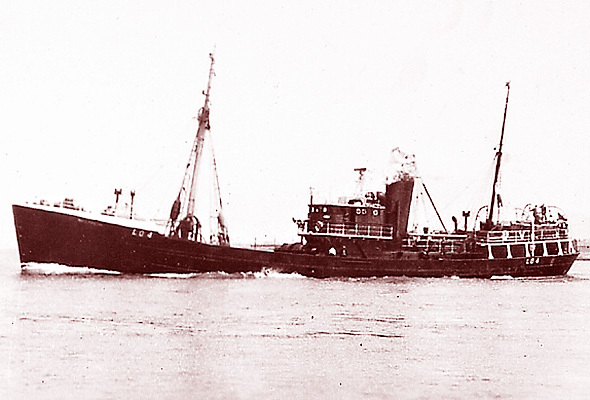 The Red Falcon – built in 1936 – was the last coal burning trawler in the lago Steam Trawler Co. Ltd. Fleet. She was formerly named Cape Barfleur. Her last voyage started on November 25th 1959 when she sailed for the Icelandic fishing grounds, leaving on the same tide as the Red Sabre. The two vessels fished together at Iceland for most of the trip and turned for home at the same time. Red Falcon was skippered by Alexander Hardy (45), of Broadway, Fleetwood. A most experienced skipper who undertook minesweeping duties during the war. He was in contact with Sabre’s skipper (Tom McKernan) and the skipper of the Red Knight (John Mecklenburgh) during the voyage home. Both men later thought the Falcon had been engulfed by a tidal wave. Skipper McKernan had been about 70 miles ahead of the Falcon and Skipper Mecklenburgh about 150 miles behind. Both reported severe gales – with winds gusting to 100mph. Skipper McKernan advised the Falcon to avoid the tidal race off Islay which Skipper Hardy acknowledged. The area was known to be treacherous with swirling tides. But relatives had received wires from the ship saying she would be docking Monday night. As was the custom, many went to meet her in on that Monday – December 14th. It was not unusual for ships to be delayed by bad weather and families again went down to meet Falcon on the Tuesday. The radio silence from the vessel was ominous and anxiety mounted. “We fear the worst,” said Captain E.D.W. Lawford, DSO, RN, managing director of the owners. And as the terrible news began to sink in, the “mission men” continued their task of comforting the bereaved. The Superintendent of the Fleetwood branch of the Royal National Mission to Deep Sea Fishermen, Mr Duncan Brown, and the Port Missioner Mr.G. Wright, visited homes. All but one of the crew – Fireman Joseph Mair of Portsmouth – lived in Fleetwood. Skipper Alexander Hardy (45), Broadway, Mate George Gloss (59), Gordon Road, Chief Engineer Jim Carter (39), Macbeth Road, Second engineer William Irvine (45), Bramley Avenue, Bosun Jim Gorst, (38), Wingrove Road, Deckhands Joseph Blackburn (21), Radcliffe Road, Jack McDaid (27) North Street, Jim Read (26), Willow Street, Edward Archer (31), Belmont Road, George Harlin (24), Chatsworth Avenue, Joseph Riches (26), Knowsley Gate, Jim Morley (27), Heathfield Road, William Deery (36), Bold Street, Jack Preston (16), Radcliffe Road, Wireless Operator William Cooper (46), Heathfield Road, Cook George McLoughlin (44) Witton Grove, Assistant Cook John Coultas (20), Abbotts Walk, Fireman John Smith (33), Whinfield Avenue. Within days an appeal fund for dependants was set up by the Mayor of Fleetwood (Councillor Jim Shaw, JP). Owners, lago, started it with a £1,000 donation and the fund eventually topped £20,000, with cash pouring in from all over the country. A cheque for £10.10s was received from the Church of Scotland on the island of Tiree, Inner Hebrides. An accompanying letter said the loss of the Falcon so near their shores had made a deep impression on the community. It was on the rocky shores of Tiree that wreckage from the Falcon was washed up. Another donation was from the isle of Mull and one from people in Oban. Seven months after the loss an inquiry opened at Fleetwood Town Hall. It was revealed that the last radio contact with the Falcon was at 7am on December 14th. The Sabre’s skipper called up the Falcon and reported the wind as force 10 between Skerryvore and Rathlin Island. He said he had had a very rough passage but was now under the lee of Rathlin. Falcon’s skipper said he was abeam of Skerryvore Light and he would avoid the tide race. A few minutes later the Red Knight had also been in radio contact with the Falcon and heard she was in bad weather with a “confused” sea. The Sabre and Knight continued their homeward journey and no real anxiety was felt until Knight – which had been astern of the Falcon – docked at midnight on Tuesday, December 15th. A 3-day search was launched. Both skippers thought a tidal wave had swamped the Falcon. The inquiry believed it was difficult to ascertain the cause of the loss but the most probable cause was that the ship was “overwhelmed”. And its loss left a town overwhelmed with shock and grief. First published in Life in Fleetwood issue 27, December 1992 / January 1993.